Searching for the best San Francisco LASIK Surgeon? Dr. Goodman has been performing LASIK surgery in San Francisco for over 20 years. He is also the founder of Northern California's largest single specialty eye surgery center, The Eye Surgery Center of San Francisco. If you are considering laser vision correction click here to request your appointment today! Goodman Eye Center strives to provide the best possible LASIK surgery and care in San Francisco. Come in for a consultation and rest assured that you are in great hands. Dr. Goodman is both skilled and experienced, and will work with you to make sure you are getting the individualized care that you need. When getting LASIK surgery at Goodman Eye Center in San Francisco, we offer options to fit your needs. Goodman Eye Center offers many different options for LASIK in San Francisco. 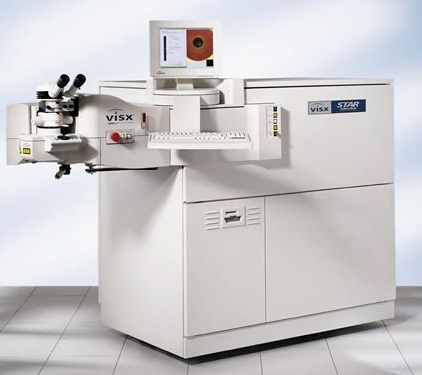 We have the VISX Star S4 Excimer Laser, CustomVue technology, and Intralase bladeless LASIK. These surgical procedures can provide independence from glasses and contact lenses. We want you to come in to our office and feel comfortable and informed. Here at Goodman Eye Center, we like to provide our patients in San Francisco knowledge of what happens during our LASIK surgery procedures as well as the many options available. Read the information below to learn more about these cutting edge procedures.To schedule your LASIK San Francisco consultation, contact Goodman Eye Center today at (415) 474-3333. LASIK is a safe, reliable and painless way to improve vision without the need for glasses or contact lenses. LASIK, which stands for laser assisted in-situ keratomileusis, is a form of refractive surgery that changes the way light enters your eye so that it focuses properly on the retina to provide clear vision. The procedure is effective for many patients with nearsightedness (myopia), farsightedness (hyperopia) and astigmatism. Watch below to see it in action! 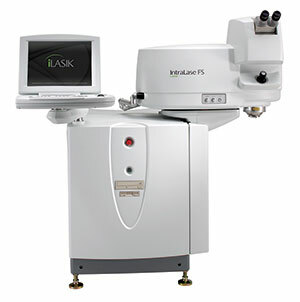 LASIK involves two different lasers, the IntraLase™, which creates the corneal flap and the STAR S4 IR™ Excimer Laser System which reshapes the cornea. The entire process of this bladeless LASIK takes about 15 minutes and is performed in our in-office surgical suite in San Francisco. Precise pulses of laser light create rows of microscopic bubbles just beneath your corneal surface in a uniform plane. 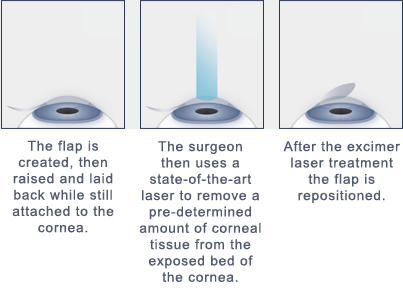 Then, the IntraLase laser stacks bubbles around your corneal diameter to create the edges of your flap. These bubbles are stacked at an angle that is determined by Dr. Goodman and is individualized to the way your eye is shaped. The process takes only about 30 seconds from start to finish—it’s quiet and comfortable. Once the flap is created, Dr. Goodman gently lifts the flap to allow for the second step of your LASIK treatment. When treatment is complete, the flap easily “locks” back into position and rapidly begins to heal. The STAR S4 IR™ Excimer Laser provides a custom corneal reshaping treatment by importing each patient’s corneal image via the WaveScan WaveFront™ System. This is known as Custom LASIK and is the most advanced technology currently available for laser vision correction. Learn more about Custom LASIK here.